St. Patrick Parish is situated in the Town of Pelham, which is located on the southern border between New Hampshire and Massachusetts. The exact date that the town was settled is unknown, although it is believed that it was either in 1721 or 1722 by John Butler and David Hamblet. Butler and Hamblet bought land two miles west of the Center of the Town. They cleared the land, sowed grain on it and returned to Woburn, Massachusetts for the winter. They returned in the spring with their families to begin their lives in Pelham. They were soon joined by other families; the Richardsons, the Wymans, the Jacques and the Gages. In 1741, the border between New Hampshire and Massachusetts was finally settled. Pelham, which had been part of the city of Old Dunstable in Massachusetts, now fell to the north of the Border. The town of Pelham was officially incorporated by Governor Benning Wentworth on September 16, 1747. By 1773, according to the provincial records of the state of New Hampshire, the population of Pelham had grown to 684 persons. Although there was no real Catholic presence in the town at its first settlement; faith in God, and support of religion has always been a founding principal. So much so that the History of Hillsborough County, NH, written in 1885 makes a point to note that the first sermon took place sometime in the early days of the settlement of Pelham. This sermon was preached high on a rock ledge about one and a half miles from the center of town on the road to Lowell, by a minister who was camped there. Records from the 1740s also indicate that it was the Town of Pelham that secured the services of its first ministers and paid them a salary. According to a history of St. Patrick Parish by Harry Atwood, by the year 1900 there were only 12 to 15 Catholics living in Pelham. In order to attend Mass, they had to travel to the neighboring towns of Salem, New Hampshire; or Lowell, Collinsville, Methuen or Lawrence, Massachusetts. Between 1902 and 1905, the New Hampshire Traction Company extended its electric railway system to include Hudson, Pelham and Salem. This resulted in substantial population growth for the town, including a number of Catholic families. Visiting priests and missionaries recognized the need to provide a local place for these families to worship; and from 1908 to 1913, Mass was celebrated in the Pelham Town Hall by Father Herbert Hennon who would travel from Holy Angels Parish in Westville, New Hampshire. On May 29, 1910, the Catholic community of Pelham became a mission of St. Joseph Parish in Salem, New Hampshire. The pastor, Rev. John J. McNamara, recognized the need for a place of worship for the growing Catholic community in Pelham and in April of 1913, he acquired a site to construct a small church. St. Patrick Church was dedicated by the Most Reverend George Albert Guertin, D.D., Bishop of Manchester on September 24, 1913. The Catholic population continued to grow. St. Patrick Parish had 120 registered families in 1946. Attendance at Mass was further increased by summer residents and vacationing visitors. As a result, in September of 1946, St. Patricks Mission became St. Patrick Parish and Rev. Cornelius F. Cahill was assigned as pastor. With their own resident pastor, St. Patrick Parish would need a place for him to live. In October of 1946, the parish broke ground for the construction of a rectory, which was completed the following year. Father Cahill was pastor of St. Patrick for ten years. In that time, he acquired and renovated the former electric car barn to serve as a parish center for meetings and activities, and provided a dedicated parking lot on the parish grounds. In 1950, Father Cahill acquired the land where the future Club House [parish center] would be built. In the meantime, attendance at Mass had increased beyond the capacity of the present church building. The schedule was adjusted to provide additional Masses but it was clear that the parish would require a larger Church. Once again, Father Cahill and the parishioners of St. Patrick Parish worked together; this time to provide for the increasing number of worshippers. In 1953, the church was enlarged and faced with stone. It was dedicated on May 31st by the Most Reverend Matthew F. Brady, D.D., Bishop of Manchester. Later that year, on July 5, 1953, Bishop Brady would bless the newly completed Grotto of Our Lady of Fatima. In 1956, Rev. George R. Kilcoyne replaced Father Cahill as pastor of St. Patrick Parish. Father Kilcoyne recognized the need to provide a religious education for the children and concentrated on the construction of St. Patricks Convent School. The school was dedicated in 1961 by the Most Reverend Ernest J. Primeau, S.T.D., Bishop of Manchester and was staffed by Sisters of Mercy. The school continues to educate children in grades one through eight. You may visit the school website by clicking here. Father Kilcoyne also renovated the rectory in order to provide accomodations for an associate pastor. The population of the parish continued to increase and in 1968, Father Kilcoyne purchased property in the Gage Hill section of Pelham for a mission church. 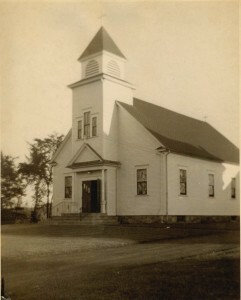 St. Margaret’s Mission Church was dedicated by the Most Reverend Ernest J. Primeau, S.T. D. on June 1, 1969. In October of 1969, Rev. William L. Quirk became pastor of St. Patrick. He was succeeded by Rev. Leo A. Shea in 1976. Father Shea served the parish until December 1, 1980 when Rev. George E. Ham became pastor. While Pastor, Father Ham, together with the parish Finance Council, had cause to address the high costs for the operation and maintenance of St. Patrick Parish properties. After careful study, it was proposed that St. Margaret Mission Church be closed, the property sold and that an addition be built on the existing St. Patrick church building. The recommendation was supported by the Parish Council and approved by parish members at a general parish meeting on May 23, 1982. An Expansion Fund Drive was launched to raise the $300,000.00 that would be needed to construct the addition to the Church. This new addition would provide a total seating capacity in the nave for 635 persons, a new reservation chapel with seating for 30 persons, a sacristy, a reconciliation chapel and a room on the lower level of the Church building to provide for baby sitting services. With the success of the drive, completion of the project was set for June of 1983. On June 17, 1983, Most Reverend Odore J. Gendron, D.D. dedicated and anointed the church and altar. In June of 1988, Rev. Edward D. Richard became pastor of St. Patrick Parish. In the time that Father Richard was pastor, the shortage of priests was beginning to affect parish assignments. The Diocese of Manchester would no longer be able to supply a vicar for St. Patrick Parish. In response, the parish hired its first pastoral associate, Kathleen Flynn. It was during this time that the Women’s Guild was formed. Among other tasks, the Women’s Guild was instrumental in forming the Hospitality Committee and the St. Patrick [Pelham] Food Pantry. In May of 2002, Rev. Wilfred Demers was assigned as an interim pastor. In June of 2002, Rev. Daniel St. Laurent was assigned to St. Patrick Parish as Pastor. Rev. Robert Guilemette became pastor in July of 2003. Rev. Eddy Bisson was assigned to serve the parish from July to September of 2008 when Rev. Paul Ruzzo was assigned as pastor. Father Ruzzo died on November 23, 2009 and the Diocese of Manchester assigned Rev. Edward Bisson to once again serve the parish as administrator until a pastor could be found for St. Patrick Parish. In June of 2010, Bishop John B. McCormack assigned Rev. Anthony F. Kuzia, CM to be pastor of St. Patrick Parish. Father Anthony is a member of the religious community of priests founded by St. Vincent de Paul; the Vincentians. Fr. Anthony’s confrere, Rev. John S. Sledziona, CM, lived in residence with him at St. Patrick Parish. Father John worked in the Diocese of Manchester as the Director of Ongoing Clergy Formation. He died very suddenly in the spring of 2016. In June of 2013, Bishop Peter A. Libasci assigned Rev. Volney J. DeRosia to be pastor of St. Patrick Parish. Sadly, in the summer of 2015, due to low enrollment St. Patrick School was closed. In the summer of 2016, the Parish Offices were moved out of the basement of the rectory into the ground floor of the School.